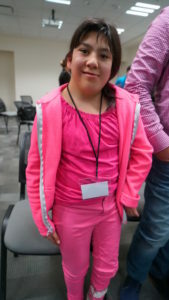 Ana Monica is a 15 year-old living in Torreón, Mexico. At 2-years-old, she suffered a stroke from a pacemaker malfunction which lead to an embolism and scoliosis. Ana Monica lived for over 10 years with severe lower-back pain which caused her to have trouble walking and living daily life. Thanks to a NuVasive Spine Foundation (NSF) mission trip in partnership with Global Spine Outreach, Ana Monica received spine surgery to correct her scoliosis in September 2017. Donate to NSF today and help kids like Ana Monica have a second-chance at life!